What is a DEP Cease & Desist Notice? A Cease & Desist notice is a violation issued to a property owner after the DEP has become aware that the sewer line is broken. 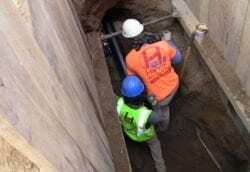 How does the DEP become aware of the sewer problem? 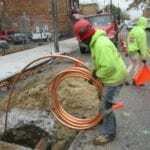 There are a number of ways that the DEP may become aware of a broken sewer line. 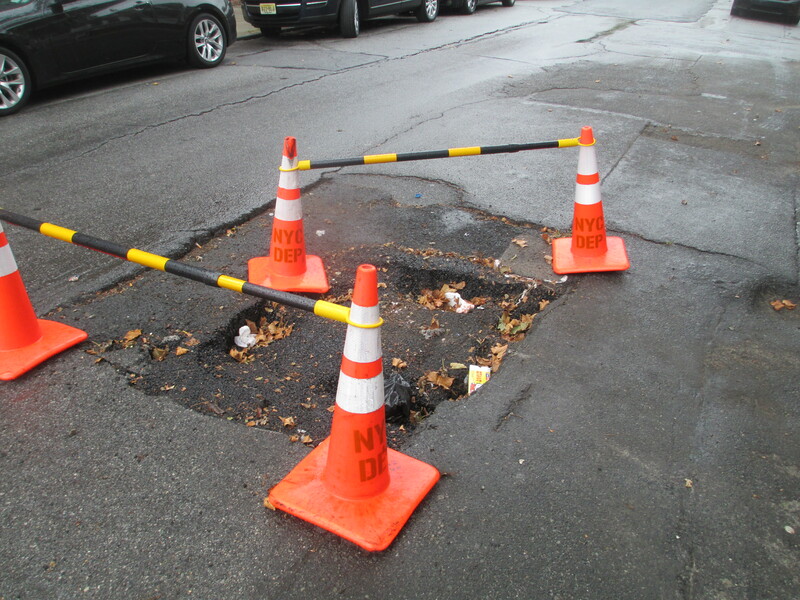 The most common scenario is after a sinkhole has formed in the roadway. 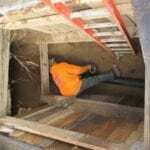 The city may become aware of the sinkhole after a neighbor reports the hole or if DOT maintenance becomes aware during a routine inspection. 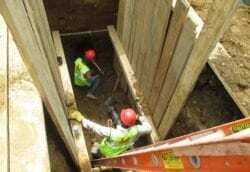 Another common scenario is if a neighbor is experiencing sewage through the foundation wall. 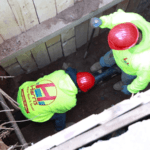 In most cases the property owners begins to assume the responsibility, hires a plumber to inspect the sewer line and determines that their sewer line is fully functional and there is another cause of the sewage seeping through the wall. 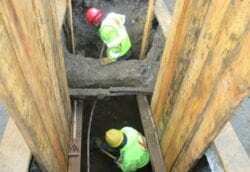 The next step is to contact the DEP to investigate the city sewer as well as neighboring houses. 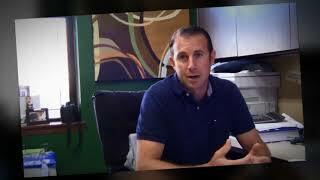 What is the process when receiving a Cease & Desist? 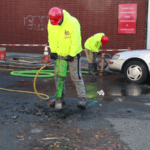 DEP performs a thorough investigation which may include a dye test of the sewer line, as well as a camera inspection. In the case of sewage surfacing in a neighbors basement the dye test is pretty straight forward, DEP will pour dye into the main house sewer line and wait to see if it shows up in the neighbors basement. 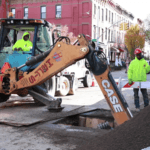 In the case of a roadway sinkhole DEP will perform a camera inspection on the neighboring houses to determine whose pipe is broken, as well as providing the location of the broken sewer pipe. 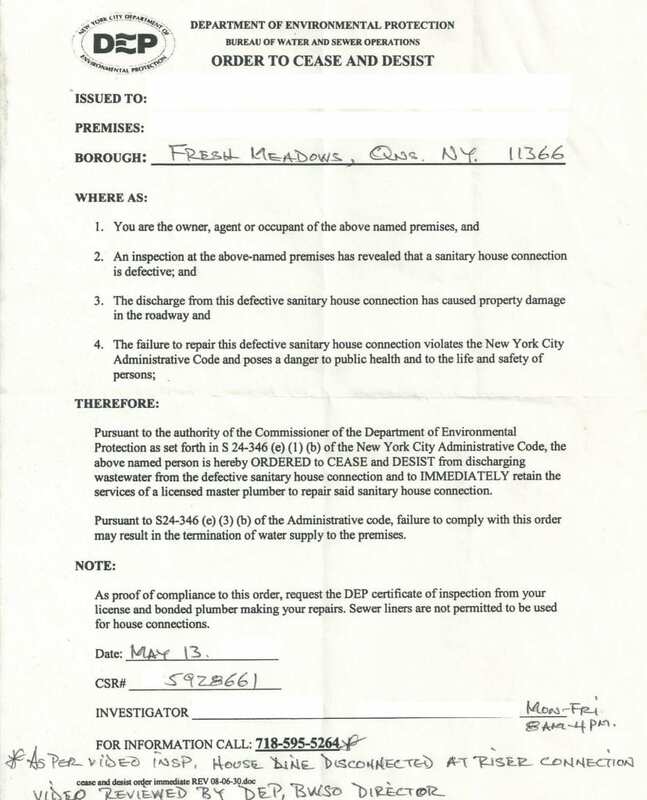 Once the broken pipe has been identified the property owner is issued a formal Cease & Desist Notice. 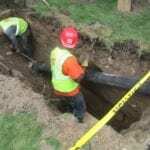 The violation notice requires the property owner to repair or replace the sewer line in a timely fashion. What can happen if the violation is ignored? If the violation is ignored the DEP may open the roadway and terminate the main water supply feeding the house. Shutting off the main water line will prevent any additional sewage from entering the sewer and avoid the existing conditions from worsening. The city may also issue a fine for not adhering to the violation notice. 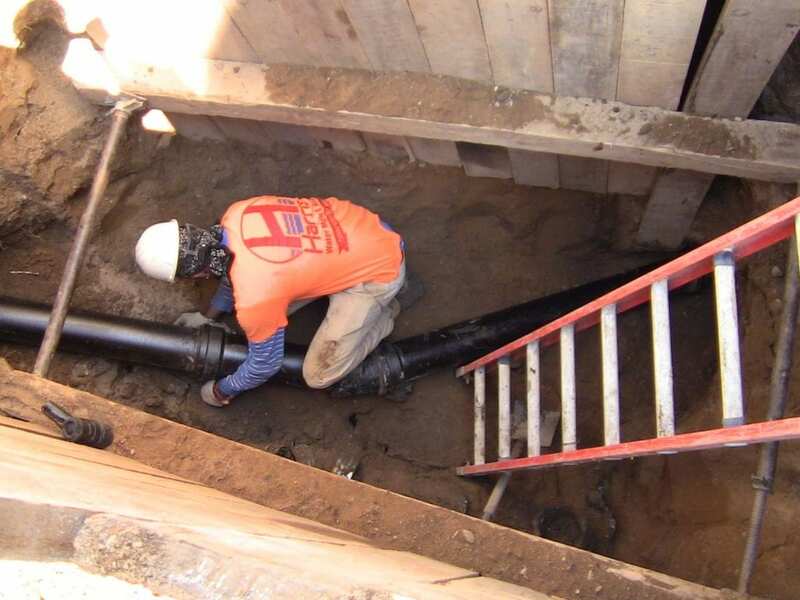 Once you have hired a Water Main & Sewer Contractor they will apply for permits to perform the sewer repair on a emergency basis. 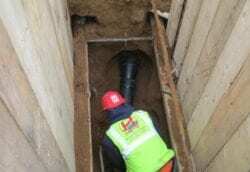 When on site the contractor will begin excavating down to the existing sewer line. 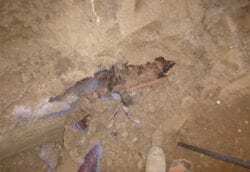 The exact location for excavation may differ pending the DEP findings. 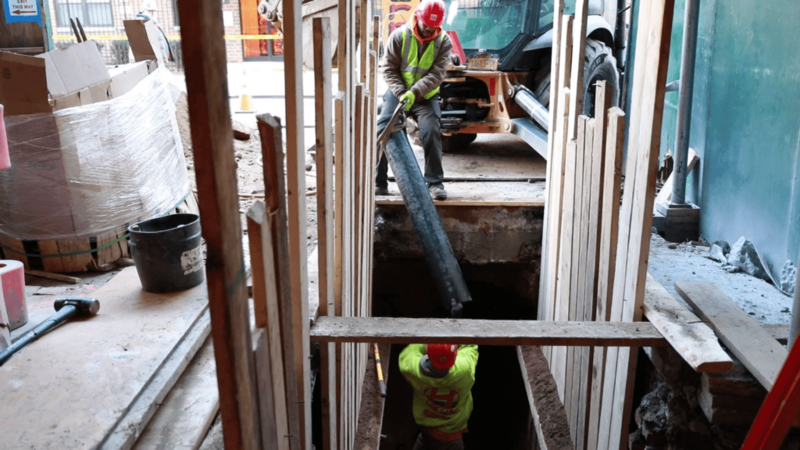 Once the excavation has been protected with shoring boards the installation crew will begin preparing the hole for the new piping installation. And finally the new pipe is installed in preparation for the DEP inspection. 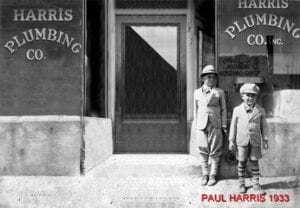 Harris gave us the best quoted price and delivered on time. They were quick and efficient. Would recommend all needing service and repair to give them a call! 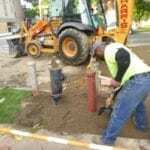 Harry Water Main is an excellent company and does great work. 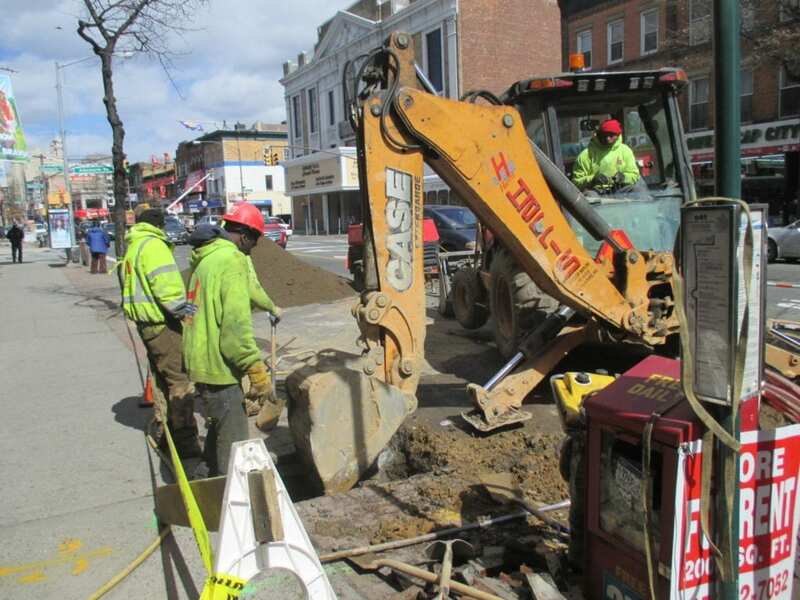 If you have a water main break, look no further. They are fast and responsive.